World Trade Office Solutions is a premier provider of South Florida Black and white and color copiers, Printers, scanners, and other electronic office equipment. World Trade Office Solutions, having serviced South Florida and regions businesses for years, takes pride in its commitment to excellent customer service and in providing the top quality printers, scanners and multifunctional copiers anywhere in South Florida. Our main goal is to help your commercial or residential office improve productivity and overall professionalism. Whether you are thinking of upgrading your current equipment or furnishing an office from scratch, World Trade Copiers encourage you to contact us at your earliest convenience. We can help evaluate the needs and budget of your corporation in order to make the very best recommendations regarding repair, replacement, renewal, or rental of products and equipment. We work hard to ensure excellent customer satisfaction with prompt arrival for all service calls. Contact World Trade Office Solutions today for more information regarding our wide range of new and refurbished equipment available in South Florida. We carry color copiers from Kyocera Mita, Sharp, Canon and Xerox to help meet your home and office needs. We have over 30 years of experience in the industry and have services available in multiple locations across the eastern part of the country. We proudly provide our clients with the very latest in scanning technology as well as other office solutions so you can get the reliable results you need. 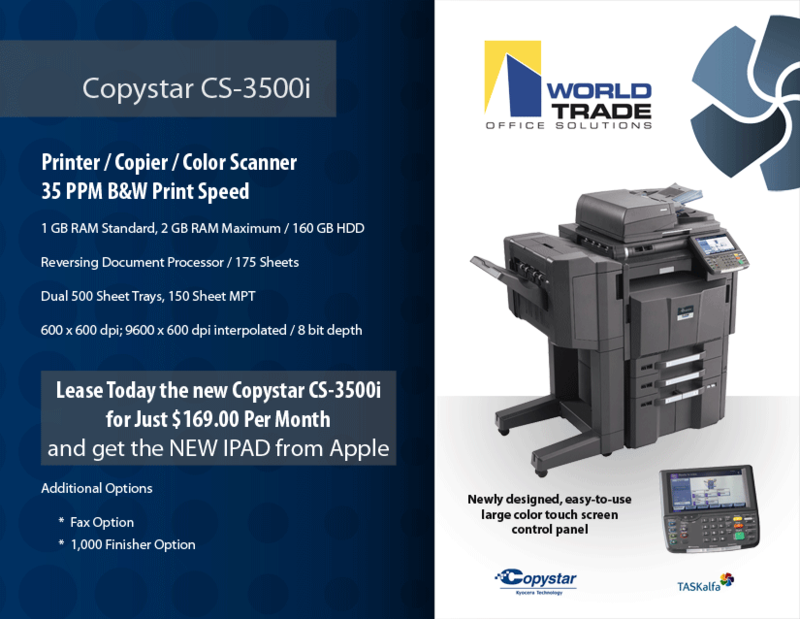 Call World Trade Copiers today to learn more. low energy use and exceptional reliability. long-life and low total cost of ownership. Click here to view our Special of the Month!